NEW Gothic Hanging Halloween Haunted House Prop Eerie Ghoul PIRATE Party Decoration Detailed Hangman Apocalypse Dead Body. REALISTIC HAUNTED, SCARY, SPOOKY and GROSS... Fresh Horror Decor from a Creepy Haunted House! A 60-inch (150cm) not-quite-fresh rotting corpse, dressed in grayish black aged death shrouds, hangs from a nylon rope. He (or she) will add an element of disgust to any haunt. This Hanging Reaper has come to guide your soul to the underworld! A frightastic decoration for a haunted house or pirate theme party. 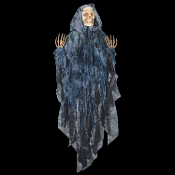 Scare friends, family and trick-or-treaters with this spooky 60-inch x 45-inch Hanged Decomposing Corpse. Features a detailed dense poly-foam skull with plastic skeleton hands cloaked in black and gray layered fabric shrouds. This scary reaper is an ideal addition to your Halloween costume party display, gothic zombie haunted house or day of the dead (dia de los muertos) celebrations. Creepy Aged dense poly-foam skull with foam padded wire poseable arms span 45-inches (112.5cm), all combine to create a grim reaper unlike the rest! Detailed realistic dense poly-foam skull and plastic skeleton hands on padded wire posable arms. Measures 13-inch (32.5cm) wide at shoulders and comes with hangtag. No lower body or legs for compact storage!